I’m behind on my email trail through Washington Creameries. Never fear, I will showcase the remaining creameries/farms before our event weekend. There really is a bigger story here. As I spend time on the websites of each creamery and write about their cheeses served at the winery this weekend…. I lose track of time as I read their family stories, the farm history, the next generation… And, I really get pulled in when they talk about the animals… sheep, cows, goats and newborns! It’s all about FAMILY. American values, hard work. REAL, healthy foods are produced on these small, farmstead family farms. So let me get on my soap box… Shopping at your local farmers’ market is the #1 way to support local farms, farmers and get the highest quality, best tasting food for your family! 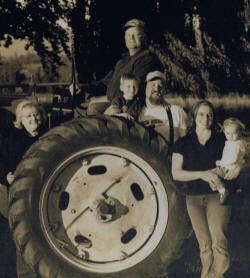 Golden Glen Creamery- Family Tradition, Family Farming, Family Values Their website is like sitting with your grandparents, paging through the picture albums and hearing the stories about family you’ve never met. You know it’s your heritage that has been handed down to carry on. Golden Glen Creamery is a family owned and operated dairy and creamery found in the heart of the beautiful and bountiful Skagit Valley in Washington State. We’re featuring their Garlic and Dill Cheddar paired with our Dungeness Red Lemberger. This cheese says "summer"! The flavor of fresh dill with a hint of crushed garlic makes this cheese perfect for anything you can think to do with it. Our Lemberger has its own spice and the pairing is fantastic. Lemberger is a wine that loves a bit of chill on it… summer, cool reds, cool cheese!!! It can't get any better than that.